WASHINGTON â" President Donald Trump will meet Russian President Vladimir Putin on Monday in Helsinki for the leadersâ first bilateral summit and a one-on-one meeting that he predicted would be the âeasiestâ talk of all after his drama-filled European trip last week. The historic summit could not come at a more sensitive time for Trump. It follows a contentious two-day NATO summit last week at which Trump berated the majority of alliance leaders â" and Germany in particular â" for not living up to their pledge to spend 2 percent of their gross domestic product on defense. Both incidents reinforced criticism that Trump employs unnecessary roughness with U.S. allies, yet is overly attentive to authoritarian adversaries like Putin. Complicating Trumpâs visit with his Russian counterpart was Fridayâs Department of Justice announcement that a grand jury had indicted 12 Ru ssian intelligence officers on hacking charges for trying to interfere with the U.S. 2016 presidential election, based on charges presented by special counsel Robert Mueller. The indictments add new pressure for Trump, who frequently dismisses the Mueller probe as a âwitch hunt,â to confront Putin about Russiaâs malign activity. Deputy Attorney General Rod Rosenstein, who announced the indictment, said he had briefed the president on the charges in advance of Trumpâs departure for Europe on Tuesday. Asked if he would confront Putin on election meddling at Fridayâs press conference with May, Trump replied, âI will absolutely, firmly ask the question.â But he also said he did not expect Putin to come clean on the matter. 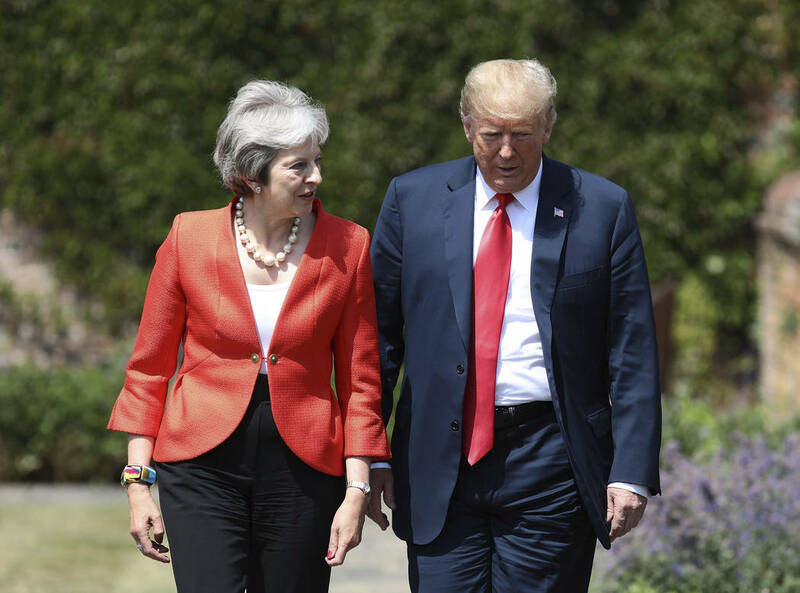 For her part, May told reporters that she welcomed Trumpâs meeting with Putin and praised the White House for expelling 60 Russian officials in March after a former Russian double agent and his daughter were poisoned by a nerve agent in Salisbury, apparently at the direction of Putinâs regime. Russia denies involvement in the Salisbury incident as well as any meddling in the 2016 presidential election. Air Force One is scheduled to touch down in Helsinki on Sunday night after Trump concludes a weekend at his Scottish golf resort, Turnberry. He is expected to meet with staff at the U.S. Emba ssy in Finlandâs capital Monday morning, then hold a bilateral meeting with Finnish President Sauli Niinisto. Niinisto will then greet Putin at the presidential palace at 1 p.m.
After Trump returns to the palace, he and Putin will hold private discussions in the Gothic Hall, followed by an expanded bilateral session and a wider working session in the Hall of Mirrors. According to the Finnish government, Putin and Trump will hold a joint press conference afterward in the Hall of State. The president plans to fly back to the United States on Monday night. Trump told reporters in the U.K. that he and Putin would discuss Ukraine, Syria, the Middle East and nuclear proliferation, as well as election meddling. Se nate Democrats on Saturday released a letter in which they urged Trump not to meet alone with Putin. It remains to be seen if any substantial announcements will follow the summit. Renoâs Ty Cobb, a former foreign policy adviser to President Ronald Reagan, said he anticipates the two sides might announce a new agreement to increase military communication around Syria to avoid an âaccidental conflagrationâ or a new round of negotiations to extend the Strategic Arms Reduction Treaty. But while h e expects the two leaders to âtry to make it a highlight,â Cobb sees the timing after the contentious NATO summit working against Trump. 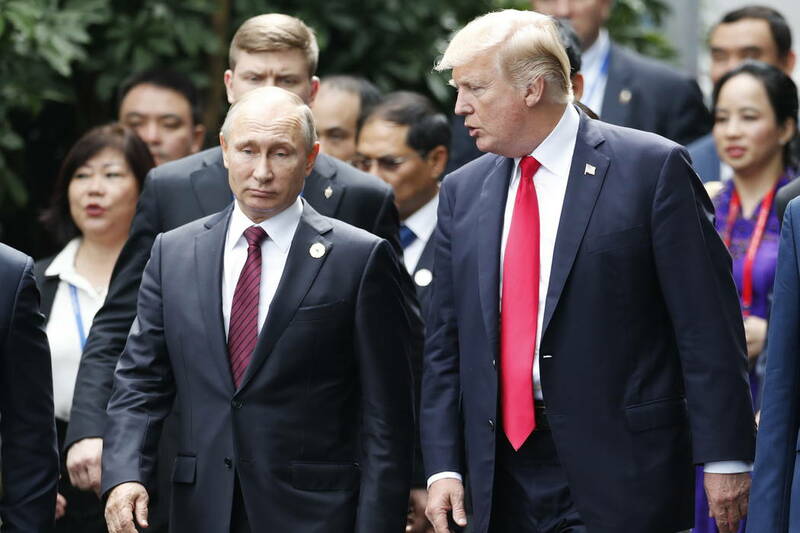 Ellen Tauscher, a former Obama undersecretary of state, also has low expectations, predicting that Trump would meet with Putin âunpreparedâ and âwithout an agenda,â as she believes he did during the June 12 summit with North Korean leader Kim Jong Un in Singapore. Tauscher observed that Trump frequently references his late uncle John Trump, who taught at MIT and schooled the president on nuclear issues. Trump, did in fact, mention his uncle Friday, and when asked about denuclearization of the Korean peninsula in Singapore. âThereâs no reason that we need to be nice to Moscow or Putin,â Cobb agreed. âItâs a banana republicâ that, if not for nuclear weapons, would not deserve the respect and attention Trump gives it. -U.S. Ambassador to Russia Jon Huntsman, at a July 5 briefing.